WORCESTER, Mass. 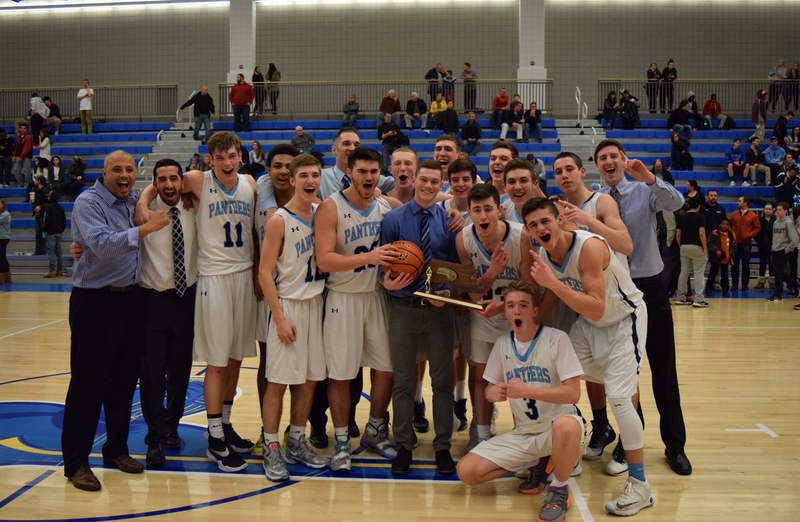 - After three consecutive years of losing to St. John's (Shrewsbury) in the Division 1 Central tournament, Franklin finally broke through, edging the Pioneers 67-64 in an overtime thriller at Worcester State, capturing the first sectional title in program history in the process. Leading 65-64 with just nine seconds remaining, Franklin (21-2) was a stop away from the state semifinals. It turns out, the Panthers got two. First, sophomore Jalen Samuels swatted a St. John's (19-4) low block shot attempt. Then, on the ensuing Pioneer inbound, an errant pass flew over the head of St. John's junior Sean Burke, and Franklin freshman Chris Edgehill scooped up the loose ball, dribbling it to the other end, draining the clock all the way down to one second before getting fouled. Two Edgehill free throws - and a failed desperation heave by St. John's - later, and the Panthers were sectional champs. "A lot of people were telling us 'we can't beat St. John's, we can't beat St. John's,' we hear it everywhere," Franklin coach C.J. Neely said. "It's nice to get that out of the way... It's nice to be on the right side of things for once." As joyously as things ended for the Panthers, it looked like they were in for another long night against St. John's, as the Pioneers opened the game on a 9-0 run, thanks in large part to senior guard Alex Bradley, who scored five points on two shots in the game's opening minutes. Even after Connor Goldstein got Franklin on the board, Bradley responded with another three to put the Pioneers up 12-2, and it looked like St. John's would again get the better of Franklin. "It was kind of frightening at first," senior forward Josh Macchi said with a laugh. "We were kind of being a little lackadaisical at the beginning, but we walked up and were able to take the game back." Macchi would be instrumental in the Panther turnaround, playing tough defense, and grabbing five rebounds in the first half. After Goldstein hit another three to make it 12-5, Samuels spun to the basket for a layup, bringing the Franklin student section to its feet. Finally, Macchi scored a layup at the buzzer of the first period, turning a potential disaster into just a five-point deficit at 16-11. "Our team motto is hard work, and I think the resiliency of the guys showed," Neely said. "They don't go away. The best thing about them is they're unselfish and they care about each other deeply outside of the backetball court." Macchi, who would go on to lead Franklin with 18 points and 11 rebounds, scored another six in the second period, as Franklin pulled to within two midway through the quarter. But, St. John's point guard Tyler Mola made a fantastic play just before the half. As Franklin was playing for the last shot, Mola jumped into a passing lane, corralled the ball, and took it the length of the court for a layup just before the buzzer. Mola, who led all scorers with 22 points, gave St. John's a 32-27 advantage at intermission. Franklin would begin to assert itself in the third though, with Samuels scoring six points in the period's first four minutes, leading to the first tie of the game since it was 0-0. Burke drove hard from the high post to quickly give St. John's the lead back at 42-40, but Connor Peterson took his man off the bounce the next time down to tie things up again. A Bobby Duquette three-pointer before another Macchi bucket allowed St. John's to bring a 45-44 lead into the fourth quarter, and Franklin had still never led. That would change quickly in the fourth, as Edgehill bombed a three from about six feet beyond the arc to tie the game at 47, then Macchi would pick up an old-fashioned three-point play to give the Panthers their first lead at 50-47. Buckets from Edgehill and Peterson gave Franklin a four-point lead late in the period, but Mola momentarily took over for St. John's with some astonishing play. After driving hard for an and-1, Mola buried a three the next time down, then answered a Macchi putback to tie the game with a slashing layup of his own to give St. John's a 60-58 lead. Running out of time, Franklin turned to Samuels, who took his man off the bounce and scored a tying layup. The game entered overtime, but the good vibes didn't continue immediately for Samuels, as the talented sophomore missed four consecutive free throws in the first two minutes of the four minute period. A great pass from Bradley to center Cole Stairs gave St. John's the early advantage in the period, but as he had done all night, Macchi answered with a score of his own. Later, with the score tied at 62, Edgehill showed that, despite only being a freshman, he feared no moment, launching another three to give Franklin a three-point lead. Sean Burke pulled the Pioneers back within one with a pair of free throws, and St. John's actually got the ball back for those last two chances that Franklin turned away. "Tonight was awesome," Macchi said with a smile. "We literally had to grind it out to the last second. We played together... This team is so unselfish, and we just stuck with it together. It was awesome to be the first team to bring a sectional title back to Franklin." The Panthers now advance to the state semifinals, where Division 1 West champion Springfield Central awaits. That game will be played at Worcester's DCU Center on Tuesday, March 14th. Tip is set for 7:30 pm.